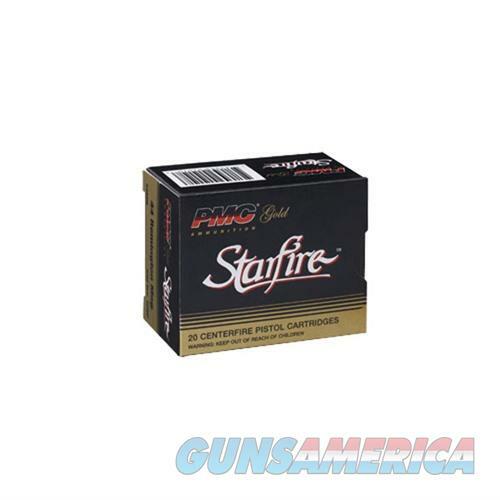 Description: Pmc Ammunition, Inc. 357SFA STARFIRE AMMO 357 MAGNUM 150GR HP For more than a decade, Starfire high-performance cartridges have been chosen as the primary means of personal defense by thousands of consumers. Pistol Hunting with Starfire is the brainchild of Tom Burczynski, the dean of high performance handgun bullet designers and a frontrunner in the new era of advanced bullet design. The key to its success is the broad, extremely reliable expansion inherent in each Starfire caliber. Created by a patented rib and flute design inside the deep, hollow-point cavity, the bullet hyper-expands to nearly twice its original diameter upon impact, delivering tremendous stopping power on target. Starfire's average penetration of 9 14 inches translates to more energy expended on the target and less wasted on landscape downrange. While the bullet design of all Starfire cartridges facilitates smooth and reliable feeding in semi-automatic handguns, the bullet ogive and propellant impulse of the 9mm Starfire have been specifically engineered to provide troublefree, completely reliable feeding in fully automatic weapons. This enables the use of high-performance hollow-point cartridges that feed just as dependably as ball ammunition when the full-auto setting is necessary.